In the morning we went out for dim sum and then headed back over to the TCC for the third and final day of Anime North. Aww. We arrived around 12:00, so if there had been any lines to enter they had dissipated, always nice! Day three was more the typical con experience for me. I didn't go in cosplay because I wasn't feeling well, and that fine. It's always nice to have a relaxing day in either no cosplay or a very easy/minimal cosplay. My only real priority was to check out the Artist's Alley, now called Comic Market. Sure, why not. While we there I wanted to pick up some pins for my growing pin collection. I did get a few, to say the least. The white cat pin is also worth mentioning. All sales proceeds from those cat pins was donated to The Forgotten Ones, a cat rescue fund. After that we headed back into the dealer's room, for another turn about the tables. This year we did the fewest turns around the dealer's room, only two, but there was so much stuff to see that each turn took far longer than usual. And of course, we found a few more goodies! We picked up Ah! My Goddess DVDs, which was a very reasonable price. 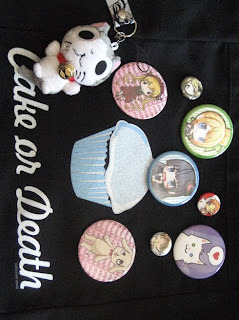 I got a little Chie plushie keychain (from Chie's Sweet Home), which is in the picture with my pins. I've never seen merchandise from that little show, and I adore it so much, so I was very excited! 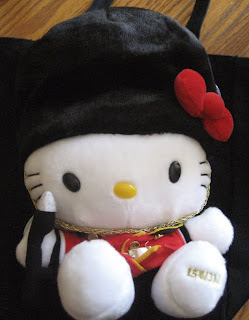 A Hello Kitty plushie dressed as beefeater - my very first Hello Kitty. And the first volume of a manga called V.B. Rose, which is about a girl who works in a bridal salon. It's my thing, really, so I hope it's good. I had been planning to head over to the Steampunk Fashion Show, but unfortunately missed it. Instead we headed over to the DT one last time to pick up my CD, and forgot it when I saw that I had won an award in the masquerade. Most Elegant Novice. So amazing, so happy, gush, gush. We got ice cream as a mini-celebration, and then headed home. Another fabulous year at Anime North! Day two was a little bit unusual for me. I decided to enter the Masquerade at Anime North this year, with my Ciel Phantomhive ballgown. And since it is a rather cumbersome outfit, I decided I would probably die from heat exhaustion, headache and foot pain if I went for the whole day. So, we didn't leave the house until 4:45, so that would could get there right in time for check-in at 5:15. The masquerade - this was my first time entering the masquerade in case that wasn't obvious - is pure chaos. It's both fun and exhausting. Check-in is at 5:15, but the show doesn't start until 8:00 or 8:30. So, after getting your picture taken, and workmanship judging, there is quite a lot of sitting. And, let me tell you, sitting in a steel hoopskirt for at least two hours, not so fun. I was extremely nervous. I can't even imagine how I did, all I remember was that when I was on stage someone yelled "I love you Ciel", or something insane. And yeah... one of the crazier things I've partaken of my own free will. After my run, I was entry number 7, we didn't hang around too long, no one had any idea when the awards would be announced, if they would even be announced that night. We watched the show a bit longer in the Green Room, and then left around entry 36 (of at least 87). We wandered around the hotel lobby taking some pictures, which was fun, and being stopped for pictures, which was also fun. A crazy con day, but a very unique and fun one too. 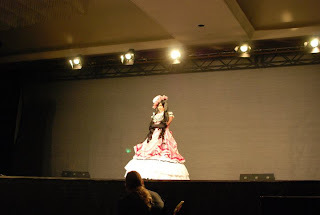 ETA: I also learned that Anime North's masquerade is now an internationally recognized competition, so the awards given out are considered major awards. Amazing! Yesterday was day one of Anime North. Everything looked to be similar to last year. Cosplays were great and of course, it was quite crowded! It was my first going through the weapons check process, which was not as involved as I expected it to be, even after I heard all the nasty details. We did our Persona 3 cosplays yesterday, and since they were variants, only the most faithful fans were able to recognize us. This was nice because it meant not too many interuptions. The one downside was that I didn't end up getting photo of myself. So, the chances of finding a picture of myself online is slim to non-existant. Most of our time was spent in the Dealer's Room, because to be honest, none of the events are really my thing. Picked up quite a few pieces of Kuroshitsuji merch, some Hetalia and a K-On! fan book. Oh, oh! And I finally found Rozen Maiden 8, which has eluded me for... awhile. Overall a pretty good start to AN! Today I decided to try detangling the ponytails of my Ciel wig. Oi. I decided to try adding a couple curls on the ends too. Oi. I decided to finish sewing the edges and tabs of the corset too. Oi. I also had a migraine while doing this. Oi. And, so now the corset is ready to be bound, which I hear is the hardest part? Oi, oi, oi. Tomorrow going to pre-register for Anime North. So close. For the past couple weeks I've been pouring over the internet looking at 18th century portraits and photos of the costumes from the 2006 Marie Antoinette movie. In the end I simply could not prevent myself from adding a frothy 18th century delight to my summer costume list. I'm a historic fashion enthusiast after all and I definitely don't have nearly enough historic costumes under my belt. 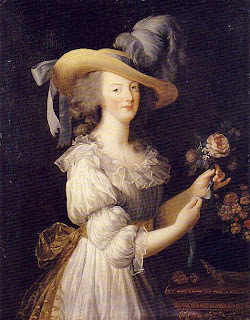 So I decided I'm making a chemise a la reine. The dress made famous - or perhaps infamous - by Marie Antoinette. 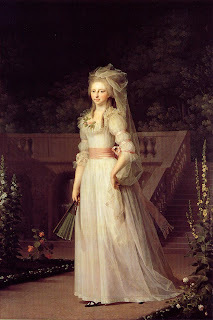 Of course, if you look at a chemise a la reine you will notice it is a chemise, obviously, and thus made out of very light and quite sheer white fabrics. That means first I need to make a corset and a petticoat. The corset: I have been planning to make a pair of 18th century stays for awhile. In fact, I bought the fabric to make my stays about this time last year, but then chickened out a little. But I think I'm ready now. I'm mostly I did, however, change the pattern I was planning to use for the project. I used a pattern from Period Costume for Stage & Screen: Patterns for Women's Dress 1500-1800 by Jean Hunnisett, though I only basically followed the boning layout given. I'm making it out of a pale blue toile de jouy, which I know is not a historically accurate fabric for clothing, but I adote the fabric far too much to care. Oh, and no one really sees the stays anyway. There are two inside layers, comprising many mismatched mystery fabrics. It is boned with cable ties. There are 49 boning channels, which is not quite fully boned, but good enough for my purposes. At the moment I'm working through making the tabs, which is even more difficult than I thought it would be. The petticoat: I picked up two meters of pale blue pre-quilted fabric for the petticoat. I'm planning on hemming the bottom with blue ribbon for a little extra je ne sais quoi. I chose the light blue so that it will hopefully show through the chemise a little, and also match the pale blue pattern on the corset. I haven't started putting it together yet, although I do have a plan in my head. My cats like sitting it on though, very cushy. Chemise a la reine: I picked up some voile (french for veil), which I seems to be a common fabric choice. I plan on following the general pattern from Norah Waugh's The Cut of Women's Clothes. I'm thinking about changing the sleeves, however, to something a little more fitted. Afterwards I'll work on getting a sash (pale blue, obviously) and a pretty little hat together. I do have a potential hat that I could use, but I might try to find something better at some point. 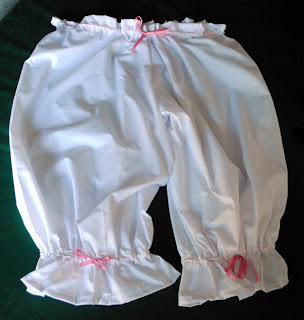 Bloomers are finished, huge and hilarious! But I love them. Sewed the bow onto the hat, so it's finished now too. I wasn't able to start working on Franziska today, unfortunately. I did not waste the day, however, I started making a pair of bloomers to go with the Ciel dress. Without being gathered up yet they are amazingly huge. It's pretty entertaining actually. ETA: Due to unfortunate circumstances beyond my control, I've decided I can't wear Franziska to AN this year, so I'm putting it aside for now, and will finish it up for FanExpo. Sigh, life. The dress is officially done. No pictures as of yet in its completed form, but I'll be getting to that soon enough. All I have left to do now is attach the white bow to the back of my hat and practice for the Masquerade. Now that's a scary thought. Countdown to Anime North: 10 Days. I'm not going to go into huge detail but managed to get a bit of work done this weekend on costume stuff, which is awesome! It's been a weekend of working. 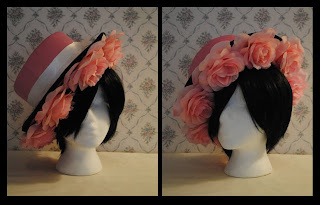 I've almost finished the hat for the Ciel dress, I just need to add the white bow on the back. The hat is not my favourite part of the costume, but I think it's pretty good for what it is. I've finishing sewing about 50% of the black ribbon detailing on the gown. This is quite possibly the most annoying part of the whole ordeal. I got my curved needle but the damn thing is so dull it couldn't puncture anything. One of the evokers has been cast and it's looking pretty good. After some sanding, filling in some holes, and painting it should be pretty awesome! Heh. I also got to casting the buttons for my Franziska costume, which I think I'm going to start working on tomorrow regardless of the gown not being fully finished. As a totally spontaneous side project (because I have sooo much time) I've made a parasol to go with the Ciel gown. I'm going to pick up a couple more supplies to finish it off tomorrow. The problem with have a boned bodice means there is metal everywhere, and you can't sew through metal. The only way I'm going to be able to finish sewing this ribbon on the front (which is going horrendously, thanks for asking) is if I get a curved needle. I can't get one though, because I don't have a car today and I have no idea when it will be back. So, how am I supposed to finish this whole damn thing by tomorrow? It's looking to be a little impossible. Big, big problem. ETA: Went back to working on the hat, and it's going a lot better than yesterday, thank goodness! Cut the brim off to cover separately. Then recovered the whole hat with felt to cover up the glue gun trails that I couldn't remove (even while utilizing a hairdryer). To reduce those bubbles in the fabric on along the edges of the brim I followed a good suggestion and used spray glue. It looks A LOT better and was worth the extra effort. I sewed together the crown piece and then re-attached the top to the brim. The edges still need to be covered with either black ribbon or black bias tape, but I have nethier right now. In the meantime I started working on the white ribbon band, but I can't really attach it until the black edging has been put on. Started work back up on the Ciel Gown. I wanted to try to do the hat today, it's not working out. It looks very sloppy, and really it's no wonder. This fabric just will not stop moving and puckering. I'm not sure what I'm going to do about it, because I'm really unhappy with it so far. I also started to putting the black ribbon on the front of the dress. It's looking pretty good, although it's quite difficult to sew around the bodice area because of the boning. I knew it would be like this, if that's any kind of consolation to me. I think I may stop for the day though, I burned my thumb and it's really driving me crazy. Bryan's costume isn't working out so well. The jacket we ordered off the internet apparently does not exist, so he got a refund but it leaves us in quite a spot. Best case scenerio: I finish Ciel this week, which is do-able, I think. Then devote the rest of my time between now and Anime North to making my Franziska coat and cravat/jabot. This weekend I absolutely HAVE TO get the buttons and evoker done... probably it would be even better if I could do them this week, but it's all getting to be a lot for me to do. So, I didn't really do much of anything last week. I wanted to, but I really couldn't muster up much in the way of motivation. And really I needed a little breather after PoP, so I don't feel too bad about my quick break. This weekend not too much was really accomplished either, to be honest. The evokers were going to be cast, but then weren't. I'll probably have to try to do them on my own some time this week (along with the Franziska buttons) because time is running out. I've also been thinking ahead to FanExpo and the costumes I thought I was going to be making. And it's started, the mind-changing. I want to do Tsumugi from the K-On! season 2 ending now. So much so that I've already picked up her shirt for the cosplay. It's going to be a fairly easy one, which will be necessary considering the very involved super secret cosplay I also have planned. It will be hard, but it will also be awesome. Crosses fingers. Third cosplay for FanExpo still do be decided, if any. And as the children take their final bows, my Pirates of Penzance adventure comes to a close. At the end of the show my fellow costumers and I were presented with huge thank you bouquets and it was all quite amazing! I got many thank you hugs from the kids and they even made us a little card shaped like a dress, very sweet indeed. Just as that adventure ended so too does another one begin! My acceptance to the costume studies program at Dalhousie arrived in the mail last Thursday the same day as closing night, and it could not have come at a more appropriate moment. I'm am very excited, and a little scared, to say the least.